(KERI) Well, there was a Super Bowl recently. And, well, I’m a Colorado native. It wasn’t one of our shining moments. Let’s just leave it at that. We’re not sports people at my house, but a big game is an excuse for making good game grub (I mean, the Olympics have me dizzy over not what events to watch, but what to cook! What to bake! Oh my! A Russian theme is in order, don’tcha think?). For our Super Bowl party with family, I was inspired to make a dessert that incorporated the flavor of orange, all in honor of those Broncos. In honor of Peyton‘s artistry. Brownies seem to fit the mood perfectly. I looked to our favorite food blog, The Smitten Kitchen, and there found a recipe for Grasshopper Brownies. I remember having them, somewhere in 1980-something, and thinking the mint was sooooo artificial tasting. Kinda eww. Of course it was, what with that creme de menthe and all. But the overall recipe sounded like a perfect foundation for my orange desires. So Marina and I huddled, and got down to the business of brownie baking. 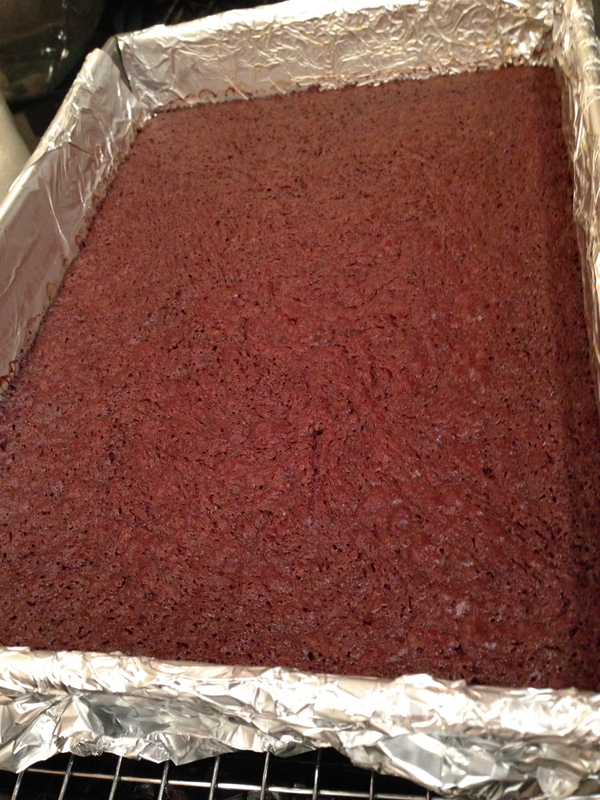 The brownie base was really loose and a little grainy in this recipe. I thought I had done something wrong. I worried, I freaked just a little. I baked it on a rack in the bottom of the oven, where it bubbled and made spurting noises. “What is wrong with you, lil brownie? Why so fussy?” I whispered into the oven. No fret, that sheet of brownie was just fine, really tasty, actually, though a little dry. I might experiment with a different brownie base recipe next time. We added orange zest to the brownie batter. Let’s get this crush started. With the foundation in place, we began layering in the punctuation – the orange. I was so pleased with the orange ganache, what with its cute orange-ness and all. Orange extract and orange liquor met up with white chocolate to scream ‘you want orange, Girls? You GOT orange.’ So good. Next time, I’d add more food coloring to ensure the ganache was really orange, not ‘salmon,’ as Marina described the color. Be patient as you lay down each layer. Follow the directions and allow the ganaches to set before you spread them. And, allow the orange ganache the chance to get to know the brownie layer for the prescribed 30 minutes before you trot in the dark chocolate ganache over the top. Trust me, you’ll have a mess if you move too fast. Isn’t that just the truth about so many things in life? After allowing all of the layers to set up, cut these little chocolatey blossoms into tiny bites. They’re rich and besides, doesn’t it feel appropriately naughty to have two, maybe even three brownies instead of just one? We think so. 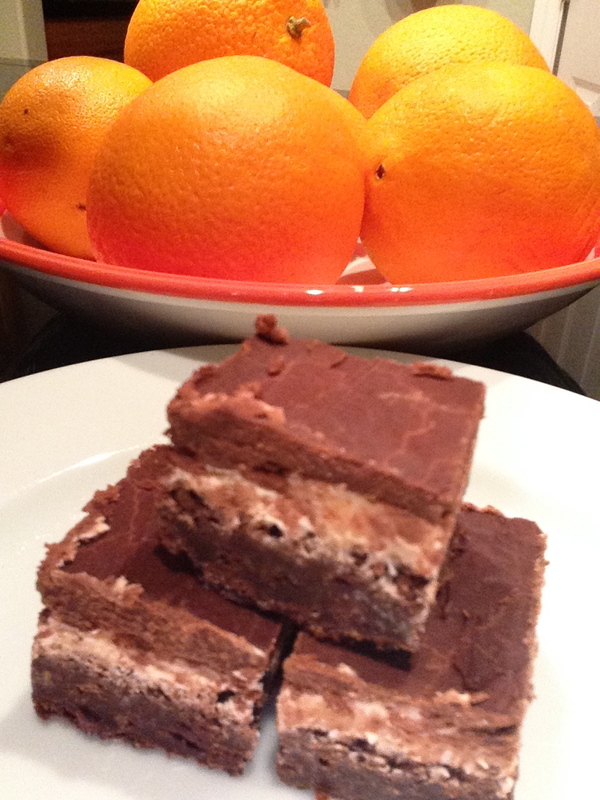 Our reinterpretation of the classic layer brownie was a huge hit. Even if the Broncos weren’t. P.S. Valentine’s Day is next week (do you have your conversation hearts purchased?). I can so see cherry flavors making a guest appearance in these brownies. Dump the orange (just like many of us fickle football fans have done to the Broncos. At least for now). 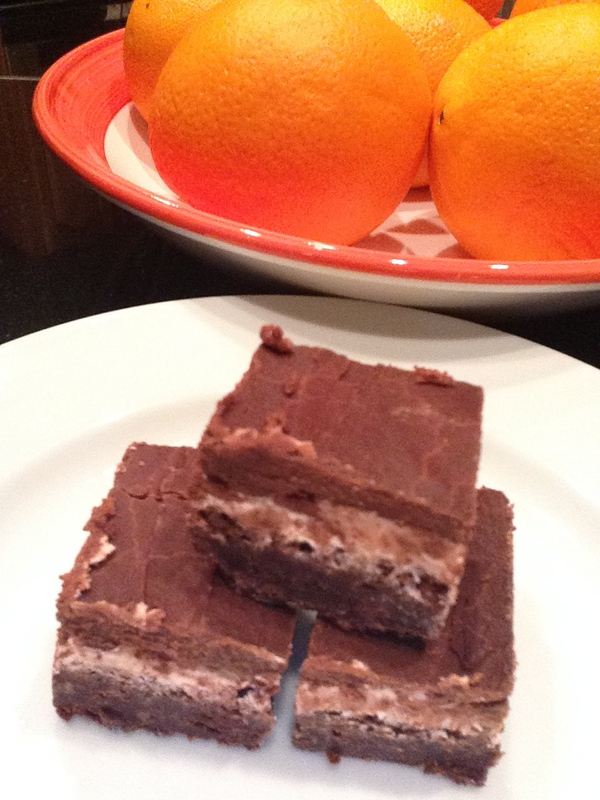 Think: dried cherries in the brownie base with cherry ganache in the middle. Bliss. Love. Place oven rack in middle position and preheat oven to 375°F. Butter a 13 x 9-inch baking pan and line with 2 crisscrossed sheets of foil, leaving a 2 inch overhang on all sides. Butter foil. 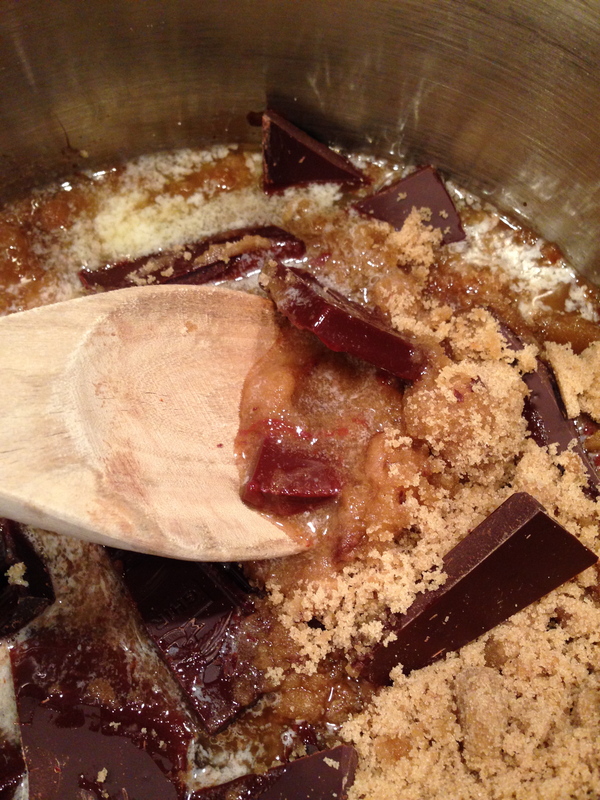 Melt butter, chocolate, and brown sugar in a heavy saucepan over medium heat, stirring occasionally, until smooth. Remove from heat and allow to cool for 5 minutes. Whisk in eggs and vanilla until combined. 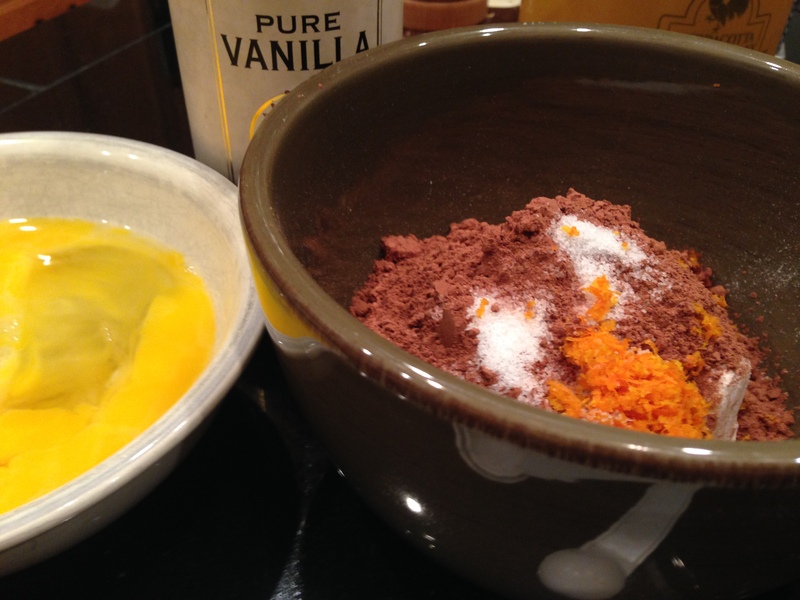 Whisk in flour, cocoa, orange zest, and salt into wet mixture until just combined. Pour batter evenly into prepared baking pan and bake until set and a wooden pick inserted in center comes out with moist crumbs sticking to it, about 20 – 25 minutes. Cool completely in pan on a rack, at least 1 1/2 hours. Bring cream to a simmer in a small saucepan and remove from heat. 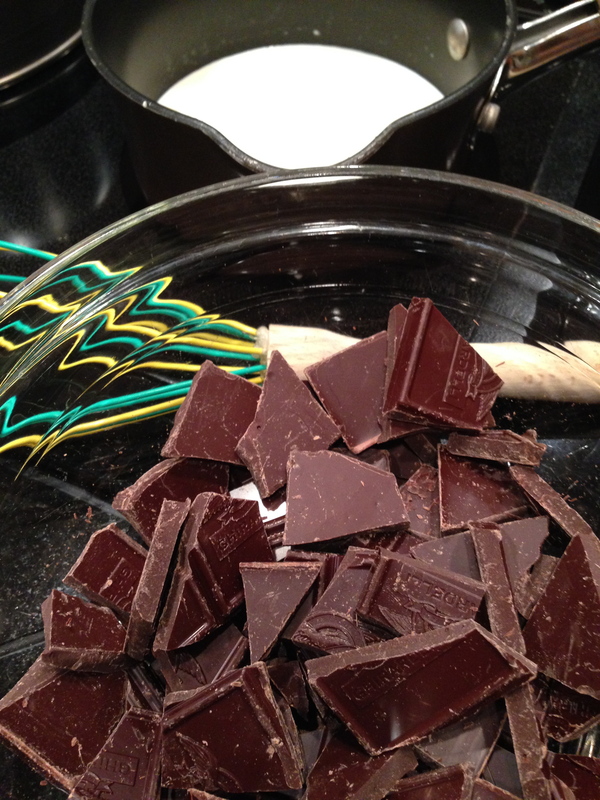 Pour over white chocolate in a bowl and cover with foil. Let stand 1 minute, then whisk until smooth. 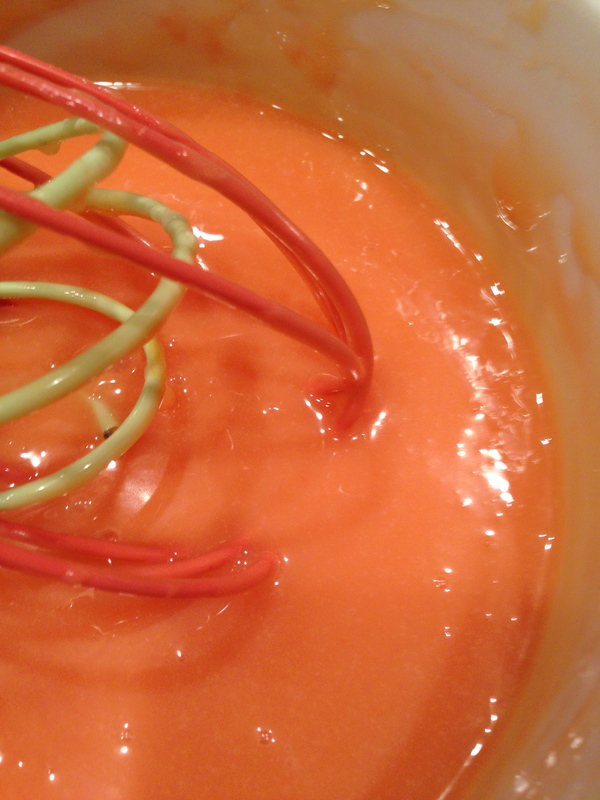 Stir in orange extract and orange liquor, then whisk in food colorings. Cover and chill, stirring occasionally, until thick, about 1 hour. Bring cream to a simmer in a small saucepan and remove from heat. Pour over bittersweet chocolate in a bowl and cover with foil. Let stand 1 minute, then whisk until smooth. Chill, covered, stirring occasionally, until thick, about 30 minutes. Be careful not to let it get too thick, so spreading it will be easier. Spread orange ganache over the top of cooled brownie in a thin layer using offset spatula, then chill until firm but still slightly sticky, about 30 minutes. Spread chocolate ganache over orange ganache, and chill until firm, about 2 hours. Lift dessert out of pan using foil overhangs. Run a knife under hot water and wipe dry, then trim edges of dessert to form a nice, even rectangle with no crusty edges. Cut dessert into small, bite-sized squares.